Kyoto shore excursions will make you fall in love with Japan at its first sight! Unlike other regions in the country, the city was left almost untouched by wars during the last century. With a legion of magnificent temples, shrines, palaces, scenic gardens as well as historical wonders. 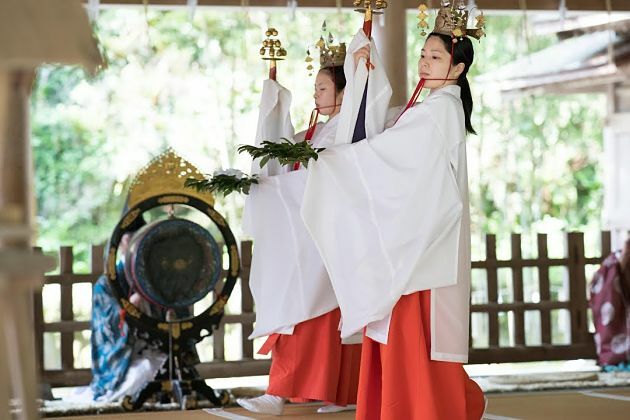 Kyoto day tours offer visitors unique Japanese experiences. Kyoto Shore Excursions will lead visitors to the feeling of satisfaction when experiencing the perfect combination between the classic and modern, walking around the bustling shopping streets, watching the charming Geisha, visiting many cultural and religious places in Kyoto such as Nijo Castle, Kinkakuji Temple, and Kiyomizu-Dera Temple. Let us bring you to Kyoto – one of the most attractive destinations in the world. Asia Shore Excursions provides a variety of Kyoto shore excursions. We will take you to the best sites for the fullest experiences of the city. Please contact us to get the best Kyoto shore excursions or customize the itinerary to meet your needs. Kyoto - the land of traditional culture is one of the most popular tourist destinations for your Kyoto shore excursion. With a centuries-old history as the island nation’s former capital, Kyoto turns into one of the main religious hubs in Japan with many of cultural sites. Here are the most extraordinary things to do & see in Kyoto city. Nijo-Jo Castle was built in 1603 as a residence for Tokugawa Leyasu - the first shogun of Edu period. After Tokugawa Shogunate fell in 1867, Nijo Castle was used as an imperial palace before being donated to the city and opened up to the public as a historic site. Nijo-Jo Castle is arguably the best surviving examples of castle palace architecture of Japan in the feudal era, and the castle was designated a UNESCO world heritage site in 1994. Visiting this palace, tourists must have been mind-boggling when staying in front of an elegant traditional Japanese architecture style and a beautiful garden surrounding. 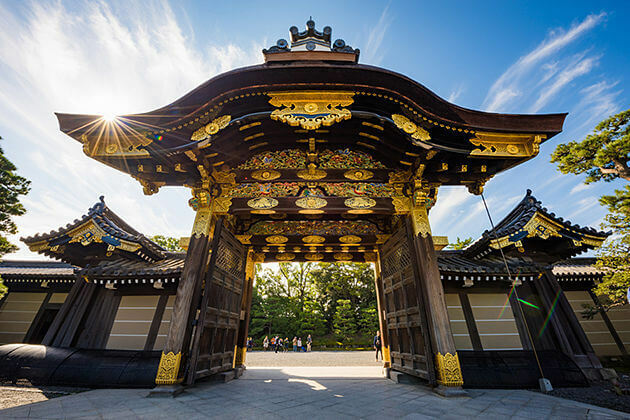 Nijo Castle can be divided into three main areas that are the main circle of defense-the Honmaru, the second circle of defense-the Ninomaru and some gardens that encircle the Honmaru and Ninomaru. The whole castle grounds and the Honmaru are besieged by stone walls and moats. 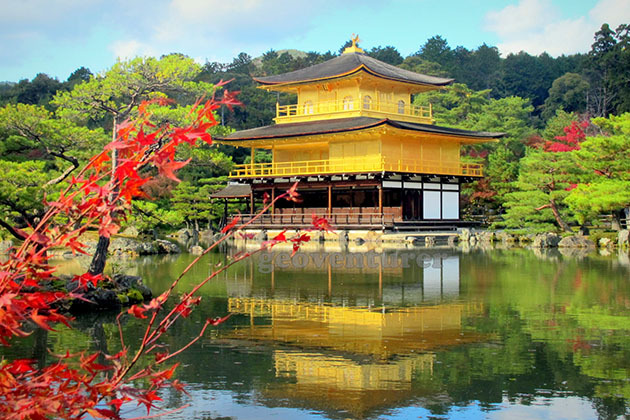 On arrival at Kyoto Shore Excursions, they will lead you to Kinkakuji Temple or also called The Golden Pavilion. The temple is located in northern Kyoto, Kinkakuji is a Zen temple which was built with an ethereal architecture consisting of a large pond and two top floors covered absolutely in gold leaf. Exactly, the Kinkakuji temple image richly adorned in gold leaf reflects gracefully in the water of Kyokochi, which is like a big mirror. Kinkakuji Temple is an influential structure built overlooking a large pond, and it is one of a kind building left of Yoshimitsu’s former retirement complex. The temple was burned down many times throughout history, and the present structure was rebuilt in 1955. Add more information, Kinkakuji was built to repeat the extravagant Kitayama culture which developed in the wealthy aristocratic circle of Kyoto city during Yoshimitsu’s times. In each floor, it represents a distinctive style of architecture. The place of Kiyomizu - Dera Temple is also known as the Pure Water temple, that is one of the most famous temples in Japan. The name “Kiyomizu” was originated from it found in the area of Ottawa Waterfall in 780. This temple provides a quite stunning view of alluring maple and cherry in the splendid scenery of current season with the characters along with the Kyoto city from the distance. This Kiyomizu-Dera Temple was added to the list of UNESCO heritage sites in 1994 as well. Kiyomizu’s location is in the lovely and neighborhood along the abrupt and bustling lanes of Higashiyama District with the various shops and many restaurants catering to tourists and pilgrims for centuries. You might stop and taste some of the specialties if your time allows. Nishiki Market seems as Kyoto’s pantry, in which tourists have a chance to have lunch with Japanese food as well as take pleasure in free time at the market perceived as the “Kyoto Kitchen” where support more than hundred stalls and stores, which is an absorbed place to find seasonal foods and specializes in Japan as sushi, dried seafood, pickles, and Kyoto’s sweets,... Nishiki Market is easily the best long-established food market in the city. Strolling between Teramachi and Shimachi, one block north of Shijo, Nishiki Market is the largest traditional food market. Nowadays, modern food shops and souvenir shops grow like mushrooms, there are still enough traditional shops to give tourists a glimpse of what a traditional shopping street must have looked like. Trekking around the market, you will find that all the main ingredients of traditional Kyoto cuisine on display here such as Tsukemono (Japanese pickles), wagashi (Japanese sweets), tea, and fresh fish, fresh tofu. In addition, some shops sell takeaway food like skewers of yakitori or sashimi. The iconic Arashiyama Bamboo Forest in Kyoto seems like one of the most beautiful and peaceful places we should come in the Kyoto day tours. This forest creates many unforgettable memories of the trip when you’re standing hand in hand and gazing up at the towering bamboo grove in an early fresh morning in Kyoto. The balletic bamboo pillars reach to the high sky, whispering back many things in the wind brightened in the morning light. Together with other sites, Arashiyama Bamboo Forest is one of the ideal photographed places in Kyoto day tours. Nevertheless, there is nothing can alter for experiencing the Bamboo Forest and standing in an awe of the amicable beauty of the surroundings. Thus, the Bamboo Forest is a popular location for couples to take many shots of wedding photographs during the morning. The presence of these newly married couples causes a commotion in the forest and it is really amazing if you can watch their photos. If you have a plan to visit Kyoto, we obviously advocate you enjoy a cup of real Japanese tea during your Kyoto Day Tours. Do you know that Kyoto is the first place where tea was introduced from China over 800 years ago, the quality of tea is regarded as being the highest in the country? From reveling in some Japanese tea in Kyoto’s breathtaking scenery to indulging in someone of a kind green tea flavored confections, we highly suggest you try green tea in Kyoto. If you are a fan of green tea or just want to try some of the great tea in Japan, you should visit Uji, being famous for the high-quality tea and Uji was one of the first places where green tea was cultivated. Besides its reputation, green tea has a lot of benefits, and one of them is rich in catechin, a natural antioxidant with the myriad of function. In other words, we can say that green tea is the blend of Japanese tea and culture in general, let come and taste its difference!